This scientific mentoring program is administered by TNC (Australia) and run by the Ecological Society of Australia (ESA). Through it the Thomas Foundation funds research projects addressing conservation problems of international importance. The program has been extended to run through 2013.
support annual prizes to recognise excellence in applied conservation research and taxonomy. The extended program will facilitate meetings of key conservation scientists. Grants will fund presentations at conferences, postgraduate student projects and the production and distribution of publications. They will establish a scientific mentoring program and sabbaticals; and they will co-fund research projects. The Foundation expects to maintain this program until 2018. 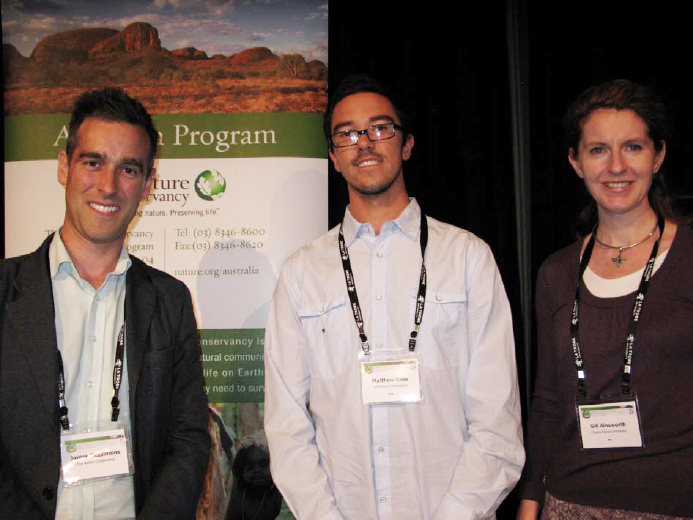 James Fitzsimons (TNC) with Matthew Rees (2012 Applied Conservation Award winner) and Gill Ainsworth (2011 winner) at the Ecological Society of Australia’s annual conference in Melbourne, December 2012.